For several days and nights, heavy storm surge pounded the shoreline, flattening dunes and blowing sand right up to the launchpads. A stone’s throw away from the spot where a Saturn V rocket sent the first humans to the Moon, the ocean took a 100-foot bite out of the beach. “I think the telling story is that the storm was almost 230 miles offshore, and it still had an impact,” Don Dankert, an environmental scientist at NASA, tells me as we stand with ecologist Carlton Hall atop a rickety metal security tower overlooking Space Coast. It is a hot, breathless day, and the surf laps gently at the deserted shore. If humans keep putting carbon in the atmosphere, eventually, Kennedy won’t be sending anybody into space. It’ll be underwater. That’s a troubling question for NASA, an agency whose most valuable piece of real estate—the $10.9 billion sandbar called Kennedy Space Center—is also its most threatened. The beating heart of American spaceflight since the Apollo program, Kennedy was, and still is, the only place on US soil where humans can launch into orbit. Today, the center is enjoying a revival, following a few dark years after the space shuttle program was mothballed and crewed launches were outsourced to Russia. The shuttle’s former digs, Launch Pad 39A, is being renovated by commercial spaceflight company SpaceX for the Falcon Heavy, a beast of a rocket designed to ferry astronauts into orbit and beyond. A few miles up the road, Launch Pad 39B is being modified for the SLS rocket, which NASA hopes will send the first humans to Mars. But a glorious future of bigger and badder rockets is by no means assured. In fact, that future is gravely threatened, not by the budget cuts that NASA speaks speaks often and candidly about, but by climate change. If humans keep putting carbon in the atmosphere, eventually, Kennedy won’t be sending anybody into space. It’ll be underwater. Kennedy’s location, at the southern end of the Merritt Island wildlife refuge and just northwest of Cape Canaveral Air Force Station, has a few other perks. 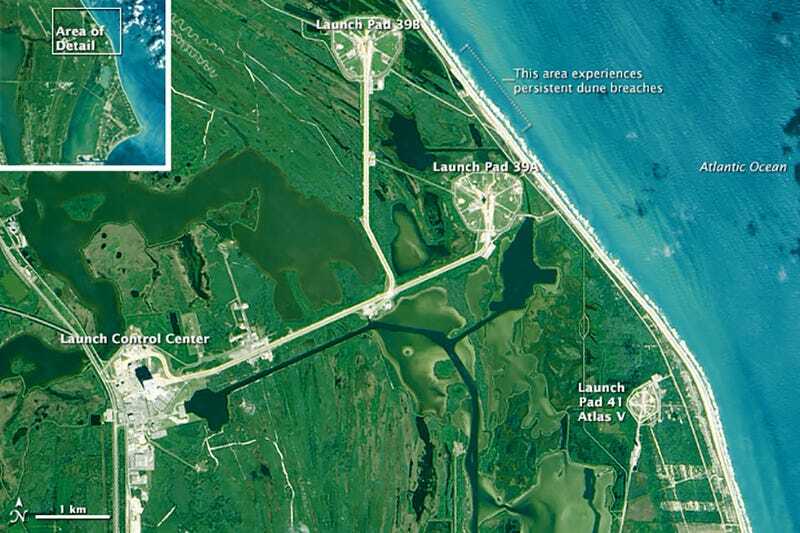 Launch pads and other resources are shared with the Air Force, and weather conditions are good year-round. Being close to the equator allows rockets to snag a bigger velocity boost from the rotation of the Earth. 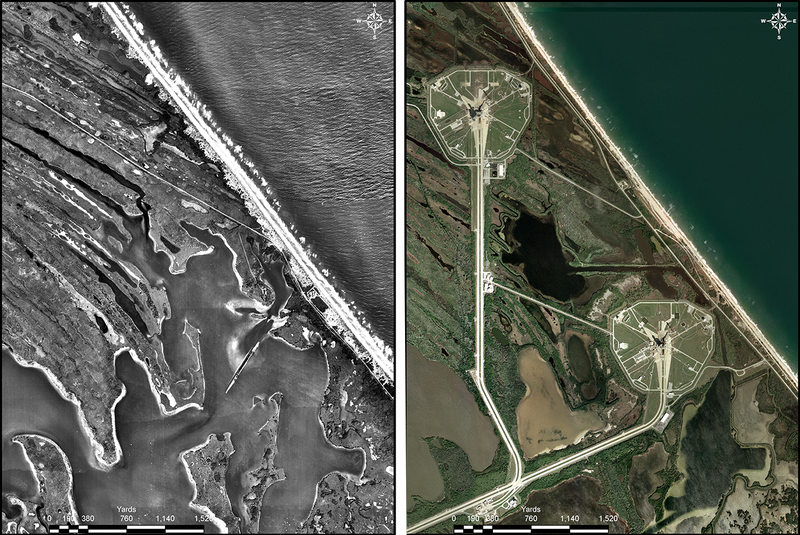 Aerial view of Kennedy Space Center’s shoreline before any launchpads were installed, left (1943) and in modern history (2007). Photos Courtesy John Jaeger. Now, that water is rising. Globally, sea levels have gone up about eight inches since the early 1900s. For the past two decades, the pace of rise has been quickening, in step with accelerated melting on the Greenland ice sheet. At Kennedy, conservative climate models project 5 to 8 inches of sea level rise by mid-century, and up to 15 inches by the 2080s. Models that take changing ice sheet dynamics into account predict as much as fifty inches (4.2 feet) of rise by the 2080s. In an even more dire scenario, Space Coast sees over six feet of rise by the end of the century, causing many of the roads and launchpads, not to mention sewers and buried electrical infrastructure, to become swamped. “I hope we don’t go there,” Hall said. On top of rising seas, Kennedy faces a stormier future—more extreme hurricanes in the summer and nor’easters in the winter. “We started to notice a real issue with coastal erosion following the 2004 hurricanes,” says John Jaeger, a coastal geologist at the University of Florida. Jaeger is part of a team of scientists who’ve been studying long-term shoreline recession at Space Coast, which can be traced back to the 1940s through aerial photographs. But while natural erosion has been reshaping Kennedy’s sandy fringes for decades, a recent uptick in powerful storms has Jaeger worried for the future. “As geologists, we know it’s these big events that do all the work,” he says. NASA’s Climate Adaptation Sciences Investigators Workgroup (CASI) shares this concern. In a recent review of the space agency’s climate vulnerability, this team of in-house Earth scientists and facilities managers cited extreme weather and flooding as major hazards to future operations at Kennedy. 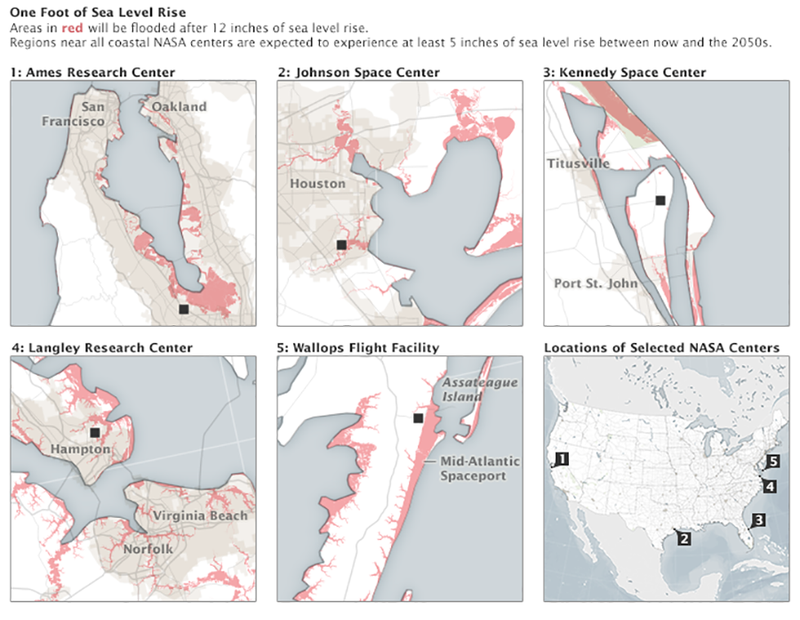 Even under modest sea level rise scenarios, ten-year flood events are expected to occur two to three times as often by mid-century. And the more the ocean rises, the easier it’ll be for storms to cause flooding. After soaking in the view for a few moments, Dankert, Hall and I climb down from the watchtower and drive south to Kennedy’s dune restoration site, which was completed in 2014 with federal Hurricane Sandy relief funds. Stretching a little over a mile between Launch Complexes 39A and 39B, the dune’s grassy slopes rise like lightly yeasted bread over the sprawling beach. If you didn’t know better, you might think the shoreline had looked this way for centuries. View along the beach of Kennedy Space Center’s dune restoration site in 2014. Photo Courtesy Dan Casper/NASA. It’s an astonishingly low-tech barrier when you consider the artificial pumping systems installed at Miami Beach to keep the ocean at bay, or theenormous seawalls some experts think we’ll need to save Manhattan. But in protecting its shoreline, NASA is trying to be considerate of all of its residents. In addition to rockets, Kennedy is home to a stunning array of wildlife, from bobcats and coyotes to southeastern beach mice, scrub jays, and gopher tortoises. It’s a major nesting site for protected leatherback, green, and loggerhead sea turtles, with thousands of baby turtles born on this small stretch of beach each year. For the past few years, the dune has held strong, preventing the ocean from spilling over onto the historic shuttle railroad that traces along the coast. Eventually, NASA would like to put in another two miles of dune, fortifying the entire shoreline between Launch Complexes 39A and 39B. As with all government projects, the hang-up is funding. 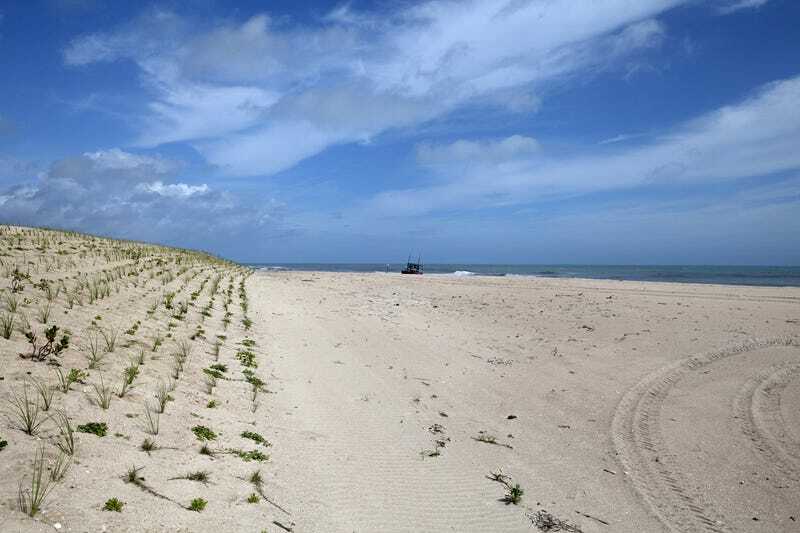 The post-Sandy dune reconstruction was completed for a cool $3 million, using beach-quality sand trucked up from Cape Canaveral. “We got really lucky—that sand was a big cost-saver,” Hall says, noting that the bill might have run in the tens of millions had NASA been forced to dredge sand from offshore. 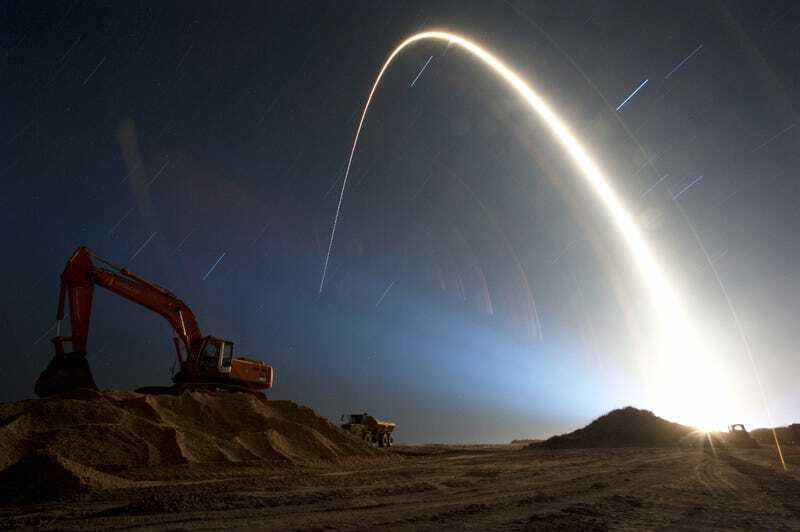 An Atlas V rocket lifts off from Cape Canaveral Air Force Station’s Launch Complex 41, illumining nearby Kennedy Space Center’s dune restoration site. Photo Courtesy Tony Gray/NASA. Although Kennedy is NASA’s most threatened asset, all of the space agency’s properties—some $32 billion worth of infrastructure used for scientific research, aeronautics testing, astronaut training, deep space missions, and vehicle assembly—face challenges in a changing climate. Sea levels at the Johnson Research Center in Texas are rising at a whopping 2.5 inches (6.4 centimeters) per decade, faster than any other coastal center by a factor of two or three. The Michoud Assembly Facility in New Orleans sits below sea level, surrounded by 19 foot-high levees, on rapidly-sinking ground. Inland facilities are bracing for more excessively hot days, and the Ames Research Center in Silicon Valley is preparing for a future of drought. “This is a very large concern for our agency as a whole,” Toufectis says. And given our growing need to go into space, not just for scientific research, but to harness new resources, colonize other worlds, and monitor and study the one overburdened biosphere we’ve got, anything that threatens future operations and NASA threatens the entire nation. At Wallops Flight Facility on Virginia’s eastern shore, climate change isn’t some existential problem for the future—it’s reality. The center’s sounding rocket launch pads, which have sent countless aircraft models and science experiments into suborbital space, sit on a six square-mile barrier island just a few hundred feet from the ocean, alongside two Virginia-owned pads used for satellite launches and ISS resupply runs. Sea levels are rising, storms are getting fiercer, and protective beaches are eroding rapidly. “We live with climate change every day,” Massey says. Wallops Island started hardening its defenses in earnest in the ‘90s, when NASA erected a 3.5 mile stone seawall in front of the launch pads. But while the wall initially helped to reduce storm damage, the beach beyond it was soon worn to shreds. By the mid 2000s, storm waves were breaking directly against the wall, causing sections to crumble into the sea. And so, in the spring of 2012 and the summer of 2014, with a $54 million investment from Congress, NASA and the US Army Corps of Engineers dredged almost 4 million cubic yards of sand from offshore, and a new beach was built beyond the wall. The impact was sudden and dramatic. Picking up and moving inland, or “managed retreat” in the urban planning parlance, is the last thing the space agency wants to do. Ironically, it probably won’t be a major storm or flood that forces NASA’s hand. It’ll be its employees. You can’t have rocket launches on Space Coast if you can’t find engineers, mission directors and launch personnel willing to run them—which is to say, people willing to live and work in an increasingly hostile environment. Full-scale withdrawal at any of NASA’s centers is probably decades away. But at Wallops, the seeds of a managed retreat mentality are already starting to sink in. There’s now an intensive screening process for what can be built on the island: “It has to be something we can only do safely over water,” says Josh Bundick, program manager for management operations at Wallops. Newer buildings are placed on elevated pilings or raised floors, with all critical electrical infrastructure installed above the flood line. Island operations are run by a skeleton crew, while the vast majority of Wallops employees work at the facility’s main base a few miles inland. NASA hasn’t broken off its relationship with Wallops Island, but it is creating distance. As I head back to Kennedy’s visitor center, ogling the tremendous Vehicle Assembly Building where the Saturn V rocket was put together, I can’t help but feel a strange sense of cognitive dissonance. Here I am, at a place that radiates optimism, that flaunts the raw power of human technology that was built to explore the infinite, only to learn of man’s essential helplessness in the face of nature. The sense of two parallel realities grows stronger as I return to my hotel in Titusville, where gaggles of tourists take selfies with replica astronaut suits and locals share beers over the latest SpaceX gossip. This isn’t a community with any intention of going anywhere. But no matter what the future holds for Space Coast, one thing is clear: defending this shoreline now isn’t a waste. Places on the front lines of climate change have lessons to teach us about standing one’s ground, and deciding when the ground can no longer stand. And those lessons may wind up being more valuable than a hundred launchpads.